On the first and third Mondays of each month, I will answer readers’ questions about Eastern Orthodoxy. If you have questions, please leave them in the comments, email them to me, or tweet them to me. Today’s question is Can you explain relics? Let me begin my saying I am no expert on holy relics, but I’ll do the best I can. At the end of the post, I’ve put a couple of helpful links to posts on relics. Relics are remains of Orthodox saints. They may be bits of clothing, small pieces of bone, or sometimes, it’s the entire body of a saint preserved in a reliquary, or special glass casing. There are also relics of the actual cross of Jesus as well. My church has two relics (if I remember correctly); a relic of St. John Maximovitch (I am thinking it’s a piece of his clothing, but I’m not sure) that is incased in the glass of an icon of him, and a relic of St. Ignatius (the patron saint of my church), which I believe is encased in the altar. What do Orthodox Christians believe about relics? We believe that relics are holy objects because we believe in the salvation of the body as well as the soul. In Orthodoxy, both the physical and the spiritual are redeemed and made holy. So the human relics that are left behind when a saint dies still contain holiness, so to speak. We see this a few places in the Bible. In 2 Kings, a man had died and his friends were burying him in what happened to be the tomb of Elisha. When the man’s body touched the bones of Elisha, the man came to life again. The story of the woman who touched the hem of Jesus’ robe comes to mind as well. Although Jesus was obviously still alive at the moment, his holiness extended into his very clothing. Beliefs about relics are related to beliefs about the incarnation. God became embodied; his energies and divinity put on skin. Christ even ascended into heaven with a human body, and indeed, we believe that he took his humanity with him when he left earth. So the reverse can happen with humans. The saints exude the the energies of God, and when they die, that hint of holiness lingers in their human remains. Initially, yes. But right now you can buy a lock of Beethoven’s hair on ebay for $795.00 (OBO, if you’re short on change today). You can also buy a small piece of Elvis’s clothing for $6.95 (that’s a steal, people!). You can view the bullet that killed Abraham Lincoln and a few small pieces of his skull in a national museum. People love this stuff – they want to see and hold things that belonged to famous people. Not that different from relics of saints. If you’ve ever lost someone close to you, did you keep one of their shirts? A blanket they made? A skillet they used? A stack of their handkerchiefs? These are relics, items that remind us of the life and love of someone dear to us. Relics of saints are the same thing. But don’t Orthodox Christians worship relics? The answer is basically the same answer for do we worship icons. We revere relics, but don’t worship them. We remember the life of the saint, and we stand in the presence of the saint’s spirituality and sacredness. We do believe that the miraculous grace of God is present in relics. There are many stories of Orthodox relics that have performed miracles, as the bones of Elisha did. 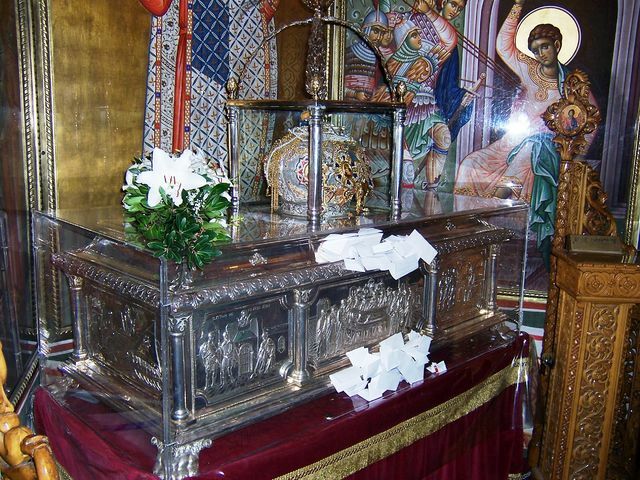 For example, the relics of St. Nectarios gave off a beautiful fragrance, and many healing miracles have been attributed to them. I understand that there is skepticism when it comes to the healing power of relics. I admit to an amount of skepticism myself. But the truth is that the belief in relics is not exclusive to Christianity: other religions (like Buddhism and Hinduism) also hold relics in high regard. I like to think of relics the way I think of objects I have that belong to loved ones who have died: sacred objects that remind me of the person I loved, and that in some mystical way, give me a blessing. This is a great post. I am glad to have found your blog. I have considered attending an Orthodox church, but so much of it is just.so.unfamiliar. Lana, thanks so much for reading. Feel free to search for “Orthodoxy” or “Orthodox” in the search box to see more posts about the OC. I understand that feeling of confusion and unfamiliarity! I had it, too, when I first attended an Orthodox Church!